If you have a toddler similar to mine, you have to battle with them at bed or nap time. I love sleep. Sleep is good. I remember it fondly & I wish that my daughter enjoyed it as much as her mommy and daddy do. Bedtime is an anxiety raising, stressful time of the evening when my daughter kicks, cries and fights tooth and nail when it is time to start her bedtime routine. It is truly exhausting. The Snicky Guide To Falling Asleep is a book written for a child similar to mine. Author Pamela Ann Will wrote The Snicky Guide To Falling Asleep because her niece has a toddler son who doesn’t like to sleep. The niece and her husband were always so tired! About the same time, she adopted a rescue dog who loves to sleep and started taking pictures of him. The book is a result of Snicky’s uncanny ability to sleep anywhere and anytime. She thought he could serve as a role model for children since he makes sleeping look fun. This book is truly adorable. 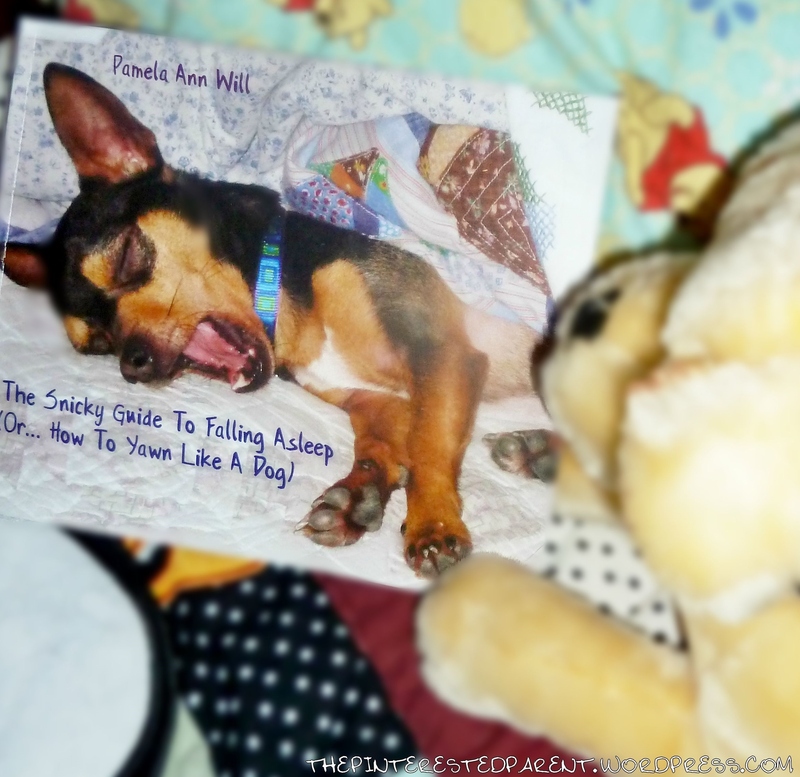 It is a photographic journey following Snicky the dog in various sleep situations. It features a cute puppy sleeping. That reason alone should make this a hit with your child. 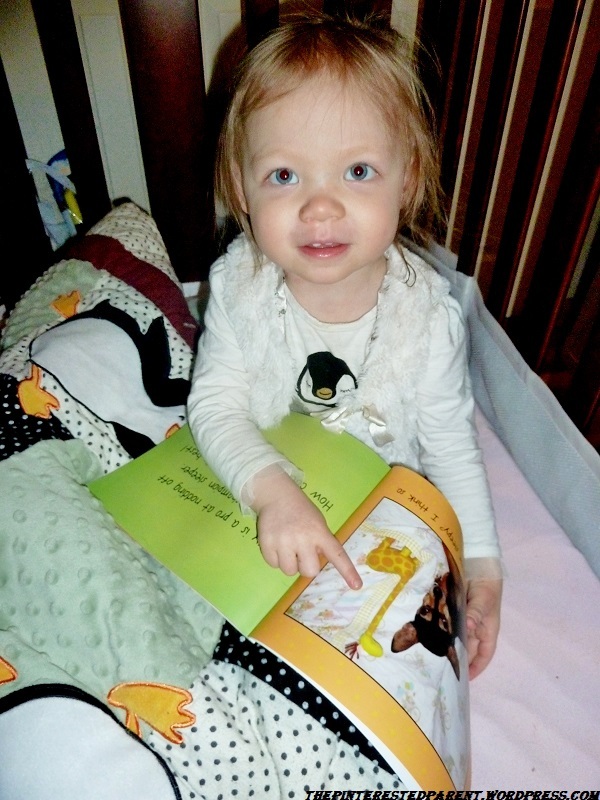 The pictures are bright and colorful and our furry friend displays different animals and toys which would be sure to capture the attention of even the youngest reader. Hey! I sleep with a stuffed yellow doggie too. Why parents will like it? You will like it for all of the reasons above. It is available in hard or soft cover and also Ibook. What did my little book critic think? She loved it! She affectionately refers to it as “cute puppy book”. She enjoyed pointing out all of the stuffed animals and toys that Snicky napped with. Here she is showing me the giraffe. Duke enjoyed it as well & even took a cue from Snicky and got a little shut eye. The Snicky Guide To Falling Asleep is available on the Apple iBookstore for $3.99. Soft and hard copies are also available at Blurb.com. For ordering information, go to SnickyBooks.com. About the author: Pamela Ann Will is a former French teacher and nanny living in the San Francisco Bay Area. Her life was enriched immeasurably when she adopted Snicky, an eight pound Miniature Pinscher. Despite being unemployed and leading a stress-free life, Snicky has cleverly mastered the art of the power nap. Pamela and Snicky hope to help sleep deprived parents and children get a good night’s sleep. That is great. Our is good once we put her down, it is just starting the routine that is tough. She goes to bed at the same time every night but still puts up such a fight once the tub is being drawn for her bath. She runs and hides. LOl! That is such a cute little book! Makes me almost wish that I had one little enough to read it to! 🙂 Thank you so much for sharing on This Momma’s Meandering Mondays! Have a great week! 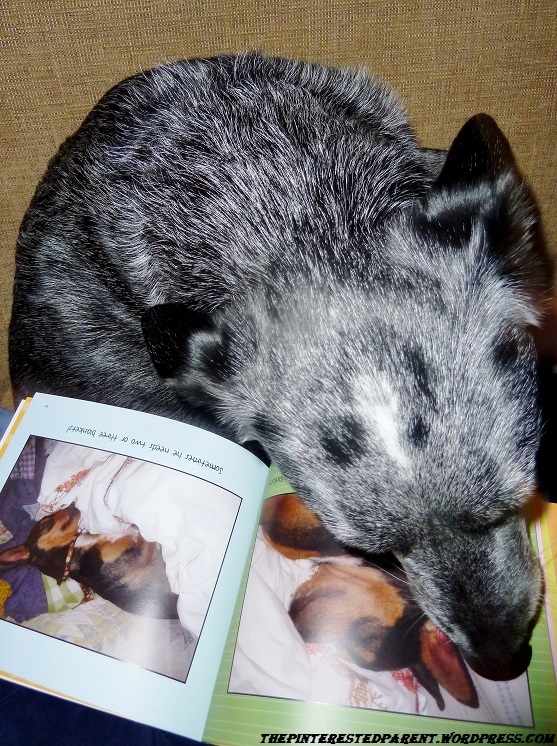 so cute, no the pic of the doggie next to your daughter all snuggled up! What a cute book! We have a new puppy and we all love him. He naps a lot, LOL. Awe. They all like the book. And it made me yawn too. This book looks to adorable! loved the pics too!